Often, it seems the federal government has it out for the English language. The President and federal agencies routinely twist the words in statutes beyond recognition. For instance, PLF has long challenged EPA’s bizarre claim that dry land is “water” under the Clean Water Act. The government’s no fan of consistency, so it should come as little surprise that the President also claims the ocean is “land” when that suits his purposes. 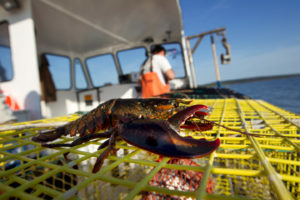 In Massachusetts Lobstermen’s Association, et al. 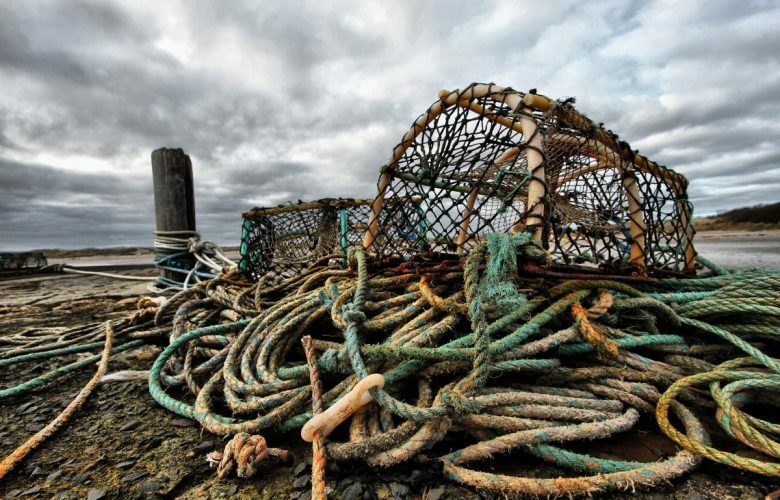 v. Ross, PLF is challenging the designation of 5,000 square miles of ocean as the Northeast Canyons and Seamounts Marine National Monument, under a statute that expressly limits designations to “land owned or controlled by the Federal Government.” The government has moved to dismiss that case arguing that the President can essentially do whatever he wants, the language of the statute be damned. This is a clear case of the Executive Branch’s claim to have “discover[ed] in a long-extant statute an unheralded power.” A full century passed between the Antiquities Act’s enactment and presidents’ assertion of the power to designate ocean monuments. Such novel claims of broad and previously unnoticed power should be met with serious skepticism. That skepticism is well placed here as the ocean is not “land owned or controlled by the Federal Government” and the novel reinterpretation of the Antiquities Act conflicts with the limits Congress imposed on the designation of marine sanctuaries. The only court to consider whether the Antiquities Act extends beyond the nation’s territorial sea correctly held that it does not. It’s as if Buster Bluth has been in charge of designating national monuments the last 12 years. Congress, for its part, has also questioned how a statute expressly limited to land could justify a massive ocean monument. Between 1906 and 2005, Presidents designated 92 national monuments on federal land, Indian land, and other land controlled by the federal government, covering a total area of 72 million acres. But they designated none beyond the limits of the territorial sea. . . That changed in 2006, when the President designated an ocean monument for the first time. 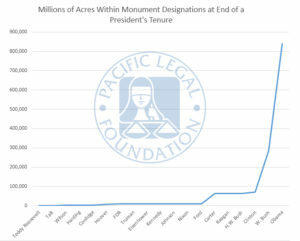 [Since then, Presidents have designated] 37 additional monuments . . . covering 760 million acres. That is more than a tenfold increase over the previous 100 years combined. The dramatic increase in the area included in national monuments over the last 10 years is directly tied to the President’s novel claim that the statute authorizes ocean monuments. They are, in a word, huge. The Northeast Canyons monument, at issue in our case, is the size of Connecticut. Another ocean monument near Hawaii is twice the size of Texas. If the president’s blatant violation of the law was not so disturbing, it would be funny to point out that when the Antiquities Act was enacted its author proclaimed that it would “certainly not” affect more than 70 million acres. Today, however, more than 800 million acres are contained within monuments and, if recent trends continue, that number will soon be in the billions. Fortunately, courts are skeptical when the executive branch claims to discover some new broad power in an old statute. And appropriately so. In such circumstances, chances are the president is really just trying to manipulate the words of an old statute to get around Congress or the limits Congress has imposed under a different statutes. Congress imposed meaningful limits on the power to designate marine sanctuaries. Consequently, the presidents claim that the Antiquities Act applies to the ocean allowed him to make an end-run around those limits. Prior to 2006, thirteen marine sanctuaries were established under the Marine Sanctuaries Act. None have been established since the President “discovered” he could accomplish the same thing through the Antiquities Act, without complying with the Marine Sanctuaries Act’s procedural and substantive requirements. Thus, the concern that Presidents might use this novel interpretation of the Antiquities Act to circumvent the limits Congress imposed under the Marine Sanctuaries Act is not merely theoretical. It is confirmed by Presidents completely forsaking the establishment of marine sanctuaries since they purportedly discovered this great—and previously unheralded—power to designate ocean monuments. This case is really about the rule of law and the Constitution’s separation of powers. The Constitution provides that Congress alone can legislate. If the president doesn’t like what the law says, he has to convince Congress to change it. He can’t simply arrogate to himself the power to do whatever he wants. Unfortunately, that’s precisely what has happened under the Antiquities Act. To protect the Constitution’s balance of powers, Courts must enforce the law as written by Congress. Although no court has yet held that a monument exceeded these limits—a fact Federal Defendants stress—this case concerns a monument far beyond any previously considered. The statute’s clearest limit, and one that courts can readily enforce, is that monuments must be on “land owned or controlled by the Federal Government.” The ordinary meaning of this phrase does not extend to the ocean beyond the nation’s territorial sea—a limit that Presidents respected for the Antiquities Act’s first 100 years. And the only court to consider whether the ocean is “land owned or controlled by the Federal Government” correctly held that it is not.